Well, the 9th out of 11 place at Torquay last Sunday was a huge dissappointment for all, as for so many weeks the band rehearsed day in, day out for hours and hours. I personally thought that the band sounded the best they ever have – with a fantastic Soprano, a cracking front row and also a sound, which in my opinion was so much better than that produced from some of the other bands which came higher in the table. It is time to forget it now and move on. It is our 50th Anniversary this year, and many plans and concerts are forming on the committee, as I type! So – its back to the poster making for me and I shall start writing more frequent posts ASAP. Well, Woodfalls got the top position this year, with Sherborne coming in at 9th place, with 186 points. This was a great result for the band and all were happy at the end of the day! We had a great day out and had the chance to listen to some superb performances by top bands. And, if anything learned a little more about the competition that we face for next year’s contest! There were some truly spectacular performances – including our own band, who started the contest off to fantastic start with a “shiver down the spine” rendition of God Save the Queen. 12. Wantage Silver A (Philip Bailey) – 182. My personal favourite band being Tongwynlais band, under the superb baton of musical director Philip Harper! What a wonderfully inspiring conductor he is! Anyway – a great day was had by all, and what a cracking experience for the band. We look forward now to practicing like crazy for the upcoming Regional Area championships in Torquay in March. Another road trip here we come! Full results and report of the Yeovil Contest are at http://www.4barsrest.com/news/detail.asp?id=12889 – take a look. Also – twitter and Website updated: www.sherbornetownband.co.uk. Well, I have been busy getting together all the final bits and pieces for the concert tomorrow night. The band are sounding fantastic and its sure to be a wonderful event. The conference centre will be a great location for the band, and I am looking forward to the music and entertainment, I have to say! Aveley & Newham band will be there showing off their programme for Saturday’s contest, as will we! Also the Youth Band are going to play some of their new music, to show off their recent progress. Tickets are £6 on the door. Refreshments at the interval. Look forward to seeing you all there. In other news, the Band’s annual concert with Aveley and Newham Band will take place on Friday 4th Feb this year, at a different location – Gryphon School Conference Centre, Bristol Road. It is sure to be a night of high class entertainment and music, with the Youth Band doing a stint as usual, which (having been to Youth Band rehearsals recently, is sure to be a great performance, with some new music. I look forward to that one. For more info about the concert, be sure to check out the website, and visit the Events page. www.sherbornetownband.co.uk. Well we survived the joyous occasion that was Christmas – what a busy time, nonetheless enjoyable and rewarding. Carols around the town centre was slightly disrupted by the snow, as we couldn’t get hold of our carol books which we play from! They were stuck in Templecombe, and also many band members couldn’t get out from the villages for some of the Saturday engagements. Nonetheless we did entertain and enjoy playing for the punters of Sherborne on many other occasions – my personal favourite – Christmas Eve. We hope you enjoyed it too. Perhaps the most lovely and most rewarding time to play carols was on Boxing day at the two hospitals. We played for patients at Sherborne’s Yeatman hospital and Yeovil District Hospital. It was a joy to see the patients reaction to the Christmas tunes and also to play some requests! At Yeovil we played for a member of the band who was in the hospital – he didn’t know we were coming and I think he was pleasantly surprised! Also, we ventured to the children’s ward, which was really nice. Well, a new year and a busy one for the band – first off is Yeovil Entertainment contest on February 5th, where we hope to wow the punters and adjudicators with our fantastic programme of wild and whacky tunes. 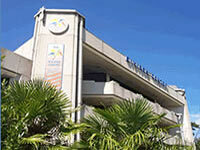 Also there is the Regional Area Championships in Torquay in March where we hope to maintain our Championship status. The band played some carols in the centre of Sherborne town on Saturday 11th December, as well as playing at Montacute House, Somerset, in the morning. Both were very successful events and raised a lot of money for the band, and the punters of Sherborne seemed to love the Christmas cheer we brought to the streets! Sorry I haven’t added this sooner – have been ill in bed all this week 🙁 Bad times. Below is a video of the one and only Calypso Carol – you can’t go down through Sherborne town centre without hearing this one once or twice! Wonderful stuff! Look forward to carolling more and more as December goes on! Well, I’ve just got back from the Abbey Primary School Christmas concert. Together, with the Abbey School choir, the Youth Band played some cracking tunes (including Abba’s Super Trooper) and some traditional Christmas stuff! It was really great to see all the kids at the concert – the band has come such a long way since its start in 2008, with just a few members. Even newest member Joe stood up and did a solo – which I thought was very brave – it was his first time playing live with the Youth Band – well done Joe, it took real guts to get up and do that! Bravo! The Abbey school choir and recorders group were fantastic and the crowd obviously appreciated your Christmas songs! Well done! The hall was packed out with parents and supporters of the band, and the Canon Eric Woods was present also, and I did see him singing along at one point! Great stuff vicar! All in all, a very enjoyable evening – and it is always great to help the band out when I can. It brings so much pleasure to people and if I can help and be a part of it, thats brilliant. That’s what banding and Sherborne Town Band is all about… long may it continue. Well done to all who participated – I look forward to carols in the street on Saturday! The band have officially started their Christmas season. It all started with the obligatory carols in Cheap Street on Saturday morning. What a joy it is to play to the people of Sherborne and provide that lovely backdrop of music which epitomises the start of Christmas. It was lovely to see the people of the town be so generous in their donations as we collected whilst playing on Saturday – we really do appreciate it and it does give us the opportunity to improve the band and its facilities, in order to keep on entertaining like this, year after year. The band also performed a concert in aid of Christmas for the Long Sutton Church – the concert went very well and a good turn out of people meant that all mince pies and mulled wine were successfully consumed and thoroughly enjoyed! Conductor Paul cosh said that the band sounded the best ever, and I quite agree – the band are sounding better by the day, and it is a great pleasure to hear such wonderful, praise and nice comments from people who attend the concerts. 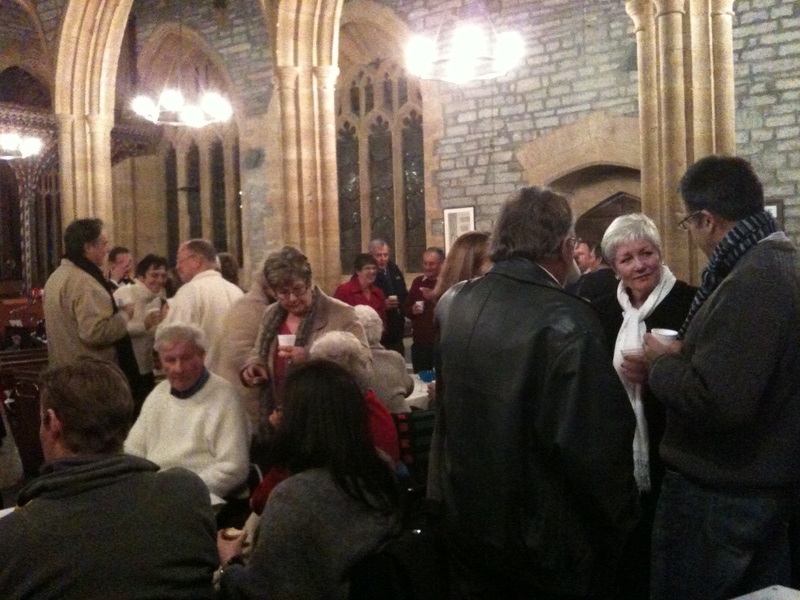 Above: The folks of Long Sutton Church gathering during the interval. 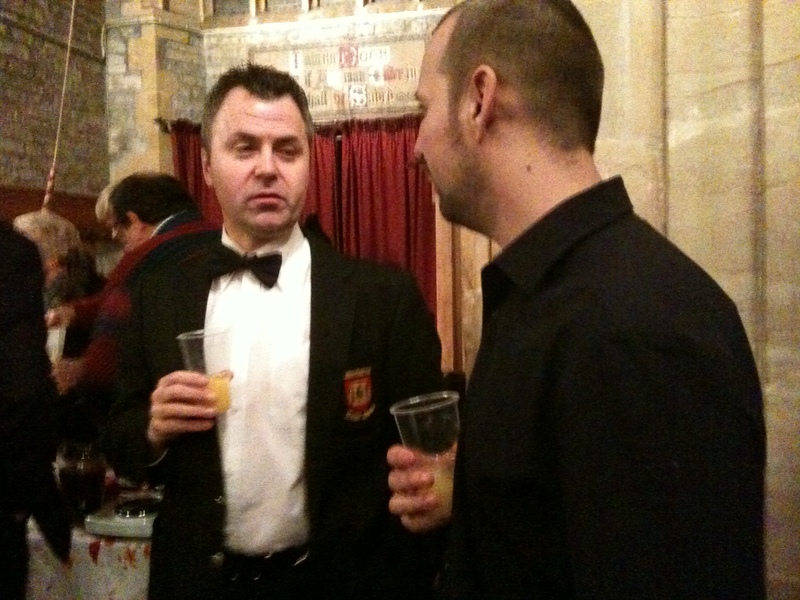 Above: Trombone player Mike Whitburn (Left) and Gareth (Right). 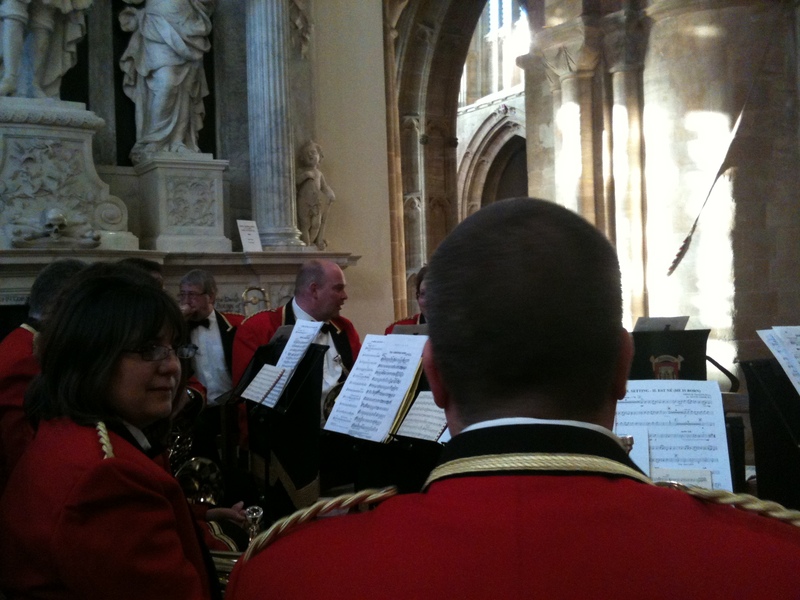 The band also played the Masons’ carol service today in the Abbey, Sherborne. The concert was very nice, and the band played superbly. The photo below is a shot of the band set up and ready to go – nearly! Above: Ann and Steve – rest of the band are getting ready to wow the crowd! 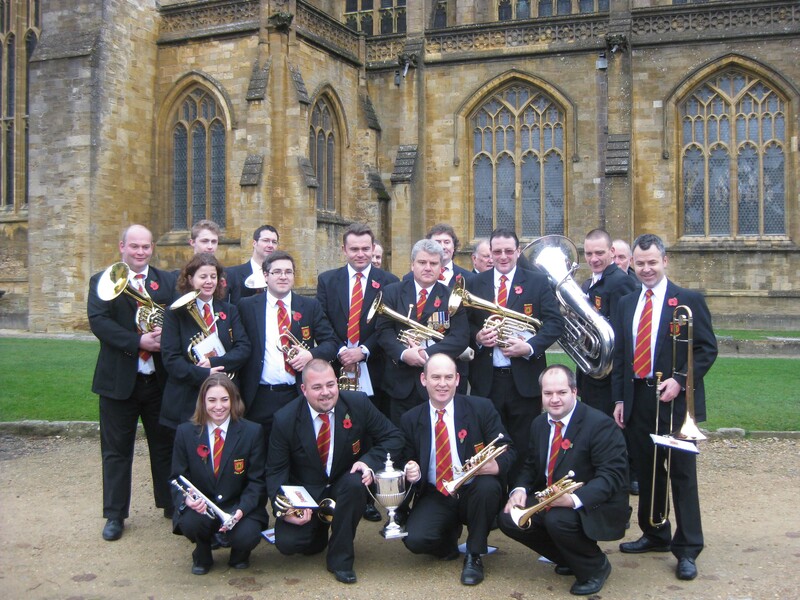 For more info on the band’s upcoming events, please take a look at www.sherbornetownband.co.uk. Over and out for now, more next weekend on the band’s Christmas activity!! Welcome to the Sherborne Town Band blog – the place where you will find all the latest news and various online activity. From here you can find the latest Twitter posts, RSS feed posts from 4BarsRest and keep updated with new content on the band website. Please feel free to comment on any of the posts and get involved with the discussions on the blog. We will try and update the Blog after every engagement we play at and keep you posted on new and exciting engagements or events we are putting on in and around the town. To keep you going, here is our latest photo, of us proudly presenting our cup from the recent contest.